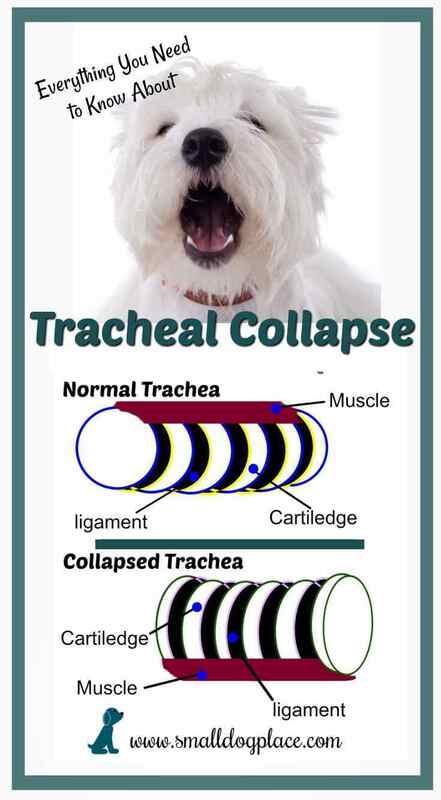 Tracheal collapse is a progressive disease involving the trachea or windpipe most commonly seen in small breed dogs. The most common breeds afflicted with this problem include Yorkies, Maltese, Toy Poodles, Pomeranian, Chihuahua, Pug, and Shih Tzu, although it can occur in other breeds, as well. Tracheal collapse should not be confused with reverse sneezing. Reverse sneezing, also known as pharyngeal gag reflex, is not really a cause for concern but often occurs as a result of a mild irritation in the back of the throat such post nasal drip. What is the Trachea ? The trachea is a relatively rigid tube consisting of rings made out of tough cartilage that resemble the letter C. The rings are not really a complete circle, but are covered with a muscle at the opening of the C called the tracheal membrane. The trachea or windpipe carries air (oxygen) into the lungs when the dog inhales and expels air (carbon dioxide) from the lungs during an exhale. How does Tracheal Collapse Occur? When the cartilage rings begin to weaken, the trachea loses its C shape and the rings begin to flatten. This flattening happens as the muscle or tracheal membrane gets floppy. As the dog inhales, air coming in causes the trachea to balloon outward. As the air leaves the lungs, the windpipe flattens giving a tickling sensation that leads to coughing. If the flattening is severe, there will be an obstructed airway causing distress to the dog. The entire length of the trachea from the throat to the chest can be collapsed, but more commonly, the collapse is in the area where the trachea passes into the chest. If the dog pants or becomes anxious, the problem worsens causing rapid breathing. The rapid breathing causes the trachea to collapse further. As the collapse worsens, inflammation occurs in the trachea creating increased secretions, which cause more coughing. More coughing creates more inflammation. And, well you can see that the process is a vicious circle. 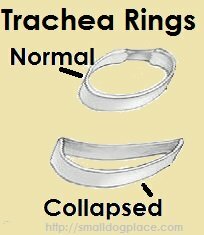 It is a chronic problem and over time, the shape of the tracheal rings flattens and becomes misshaped, causing the condition to get worse and worse. The cause of tracheal collapse is likely to have a genetic component. The cartilage of the tracheal rings in affected dogs is weaker than in normal dogs or the rings do not form correctly making the rings more prone to flattening into a U shape rather than a C shape. If the problem is not severe, you might not notice any symptoms. Perhaps one of the first symptoms to surface in dogs with collapsing tracheal is a cough that occurs after exercise or when he gets overly excited. As the problem worsens, the dog will have problems breathing during exercise. He can tire easily and show signs of shortness of breath. The cough and other signs can be triggered by excitement, fast eating or drinking, and hot and humid weather. Coughing is common as the dog tries to clear his airways, and the characteristic honking sound will resemble the sound made by a goose. In very severe cases, the gums will look blue as breathing becomes more difficult. As mentioned earlier, when this occurs, it is a medical emergency. Symptoms usually begin in middle age by about the age of 6 or 7, but they can occur at any age. Exposure to environmental respiratory irritants such as cigarette smoke, dust, etc. The veterinarian will diagnose the problem based on the symptoms and of the will make use of X-ray to confirm the diagnosis. More sophisticated techniques are used such as Fluoroscopy, which is a moving X-ray. This method allows the vet to visualize the dog’s trachea while the dog inhales and exhales. Usually this technology is only available in teaching hospitals. Another technique is endoscopy which allows the vet to view the interior of the trachea. During this procedure, the dog is anesthetized, and the vet can observe the inside of the trachea and take samples of tissue to culture. If the vet suspects the heart is compromised, an echo-cardiogram can be done to evaluate cardiac function. Sometimes, treatment of any secondary problems may alleviate some of the distress of tracheal collapse. For example, if the dog loses weight or the owner quits smoking around the dog, symptoms will lessen. Removing other environmental pollutants such as dust, mold and other indoor pollution helps. HEPA-style air filters and vacuuming regularly also helps clear up the air both for humans and dogs. Sometimes treatment with antibiotics to clear up respiratory tract infections helps. Veterinarians often prescribe cough suppressants. Corticosteroids such as prednisone given on a short term basis often help reduce the amount of mucus secretions. Some vets will suggest Inhalers for dogs, similar to those used in humans. Sometimes sedatives are used to help reduce the anxiety associated with difficulty breathing. Holistic veterinarians will also likely recommend something that helps build cartilage. If the dog is overweight, a strict diet is usually highly recommended. Activity should be restricted. During walks, the dog should wear a harness rather than a collar to take any pressure off of the trachea. In severe cases, so little oxygen is reaching the lungs that the dog’s mucous membranes (the gums in his mouth) become blue, and the dog collapses. This is a medical emergency, and the dog needs to get to the emergency veterinary hospital a.s.a.p. The dog is often tranquilized and given oxygen therapy along with cough suppressants. Approximately 70% of dogs respond to this medical management with good long term results. Surgery is often recommended if the dog does not respond to the medical management prescribed. Several different procedures are currently available, but owners usually must seek treatment options from a specialist. One type of surgery involves inserting a rigid prosthesis around the trachea which serves to create a trachea that cannot collapse. There can be major complications to this procedure. Another less invasive technique involves placing an expandable metal stent inside the trachea. This is done with an endoscope. There are side effects and risks associated with this procedure as well, but it has shown to be very successful. With any surgical procedure, medical treatment continues. This is not an easy condition to prevent, because there are no current genetic tests to perform on the parents. Often the disease does not surface until middle age and at that point it is too late for any puppies born to affected parents.